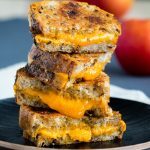 This Orange Juice Mocktail recipe is an easy way to transform a simple brunch into a fun and spectacular meal. 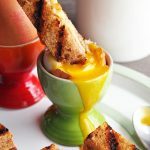 Serve this stunning and simple non-alcoholic brunch drink to kids and adults alike. 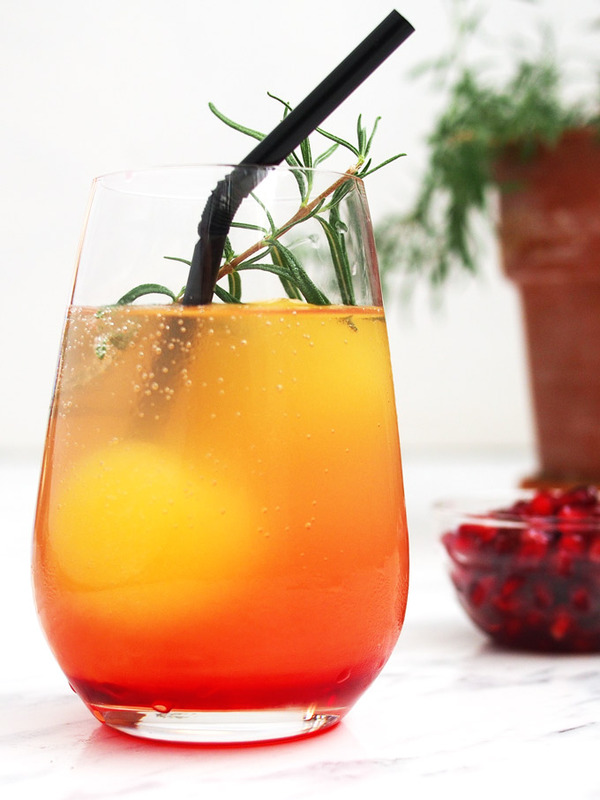 Wake up and set the brunch table with this Good Morning Sunburst Mocktail! 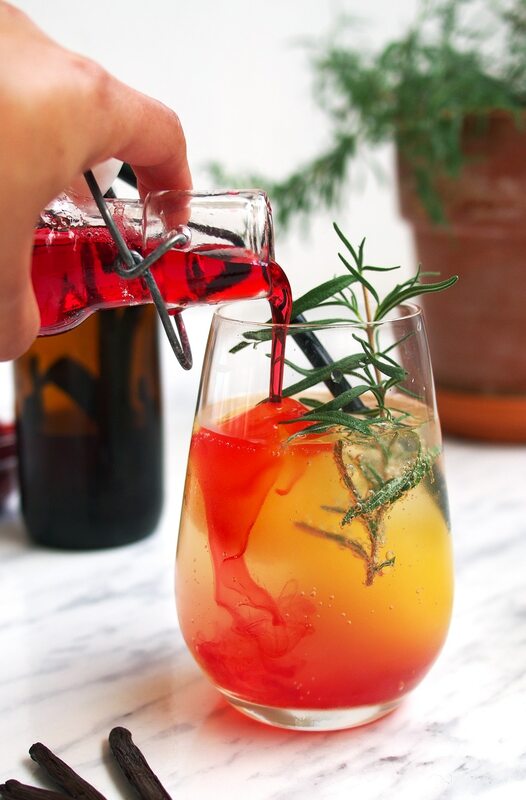 This simple orange juice mocktail with grenadine and rosemary is made for when you have something to celebrate, or even nothing at all. 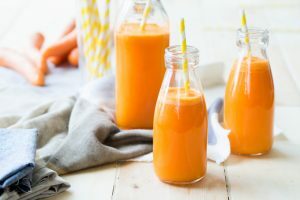 With this recipe, it’s easy to turn regular orange juice into a beautiful mocktail to give yourself a bright start to the day. Be a kid again with a mocktail. I love non-alcoholic brunch drinks because it’s enjoyable for the entire family. 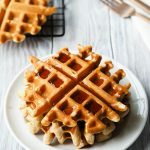 It can transform a simple breakfast into a spectacular and memorable meal. First things first. Making mocktails is very easy. But to make a mocktail that stands out, you need to have a little something special in it. What’s that something special? A few years ago, a friend bought me silicone ice ball maker as a gift. We use it all the time to make mocktails, and I’ve lost count of the number of drinks I’ve made with it. They are made for drinking whiskey, but ice balls do so much more than that. My foul-proof way is to use ice balls to transform any drink into a memorable mocktail. Filling ice ball makers with juice gives you a mocktail with a special appearance and flavor. In this Sunburst Orange Juice Mocktail, I make the ice balls with orange juice. See how cool it is that the orange ice ball looks like a sun in the drink? 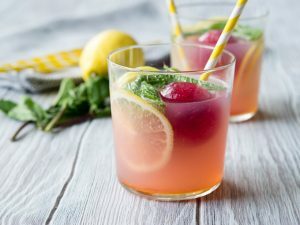 I also use ice balls in this Minty Blueberry Lemonade Mocktail by making blueberry juice ice balls. My son particularly loves this mocktail because it is so brightly colored. There are a lot of different ice ball maker choices. I like this ice ball maker because it is made with BPA-free food grade silicone, and the ice balls easily pop out. Once you have an ice ball maker, you can also freeze spiralized fruit in ice balls. This would be a fun addition to a brunch drink too. While you don’t need an ice ball maker to make this orange juice mocktail, you do need to freeze orange juice ice cubes. So go ahead and make it special. Treat yourself and make some orange juice ice balls. 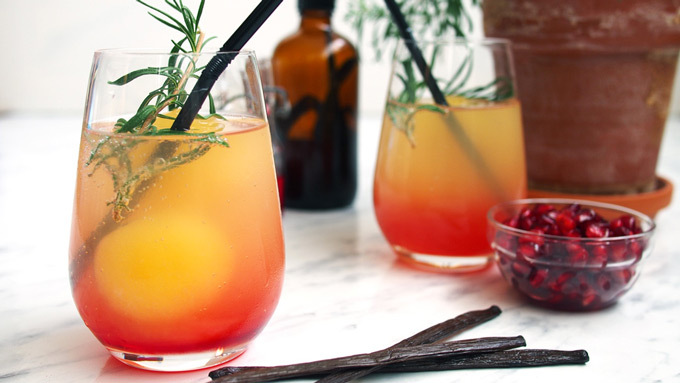 Give this brunch mocktail the distinctive look it deserves. But either way, with or without sphere ice cubes, this orange juice mocktail is incredibly easy to make and delicious. 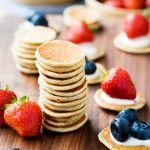 It is beautiful to serve at a breakfast or brunch gathering, but also simple enough to make at home for yourself on a regular basis. 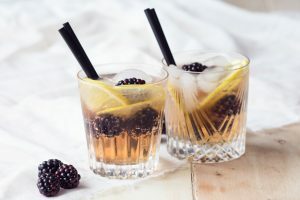 I normally enjoy this recipe as a mocktail, but to make this mocktail into a brunch cocktail, I’d suggest a touch of gin. 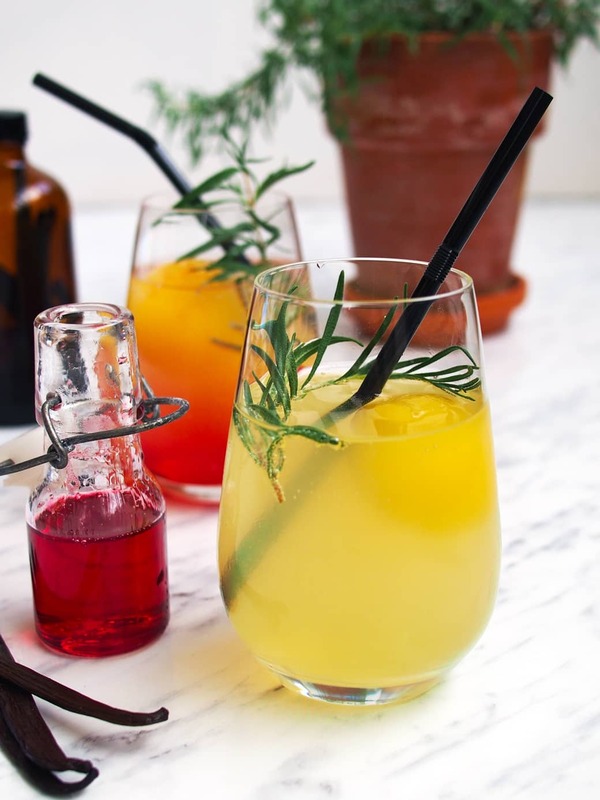 The botanical notes of the gin enhance the piney rosemary taste, and the flavors blend together into a bright cocktail. 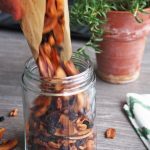 If you have time to plan ahead (or can keep this recipe in mind for a future brunch event), I’d also recommend infusing some vanilla pods in gin, and using that to give this brunch drink some extra flavor. Cheers to you and your breakfast with this Good Morning Sunburst Orange Juice Mocktail. Have fun making sunshine ice balls! 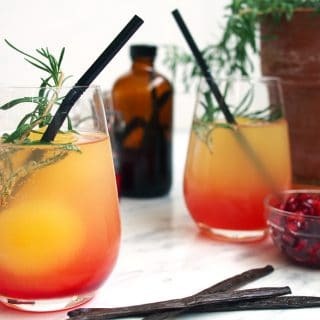 This Good Morning Sunburst - an Orange Juice Mocktail with grenadine and rosemary is the perfect way to spruce up any breakfast or brunch table. Place two orange juice ice cube spheres into a 12 ounce glass. Add in sparking water. Slowly pour in the grenadine syrup. If you would like, slowly pour in the vanilla syrup. Serve with a sprig of rosemary and a straw. You can also make this recipe with orange juice frozen into normal ice cubes. Depending on the size of your ice cube tray, use about 4-6 ice cubes per drink. This authentic grenadine syrup is made without corn syrup or artificial colors. 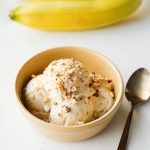 Ingredients include only: Water, Demerara Sugar, Ginger, Cassia Cinnamon, Allspice, Kola Nuts, Anise Seed, Vanilla Bean. 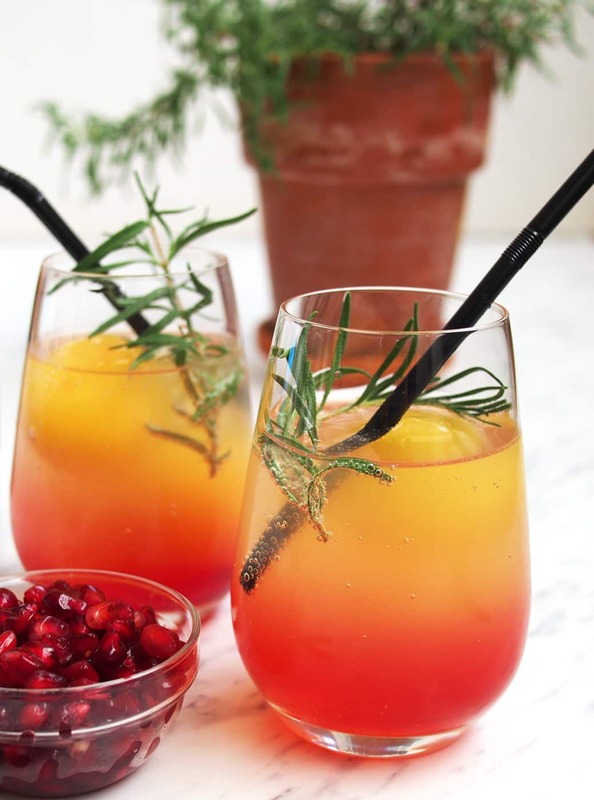 Love this easy mocktail recipe? 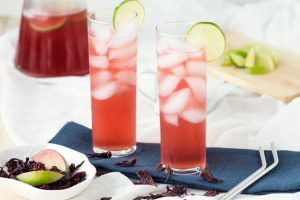 Don’t miss these other non-alcoholic brunch drinks! These were a hit with everybody at Easter brunch. Thanks for a great recipe! 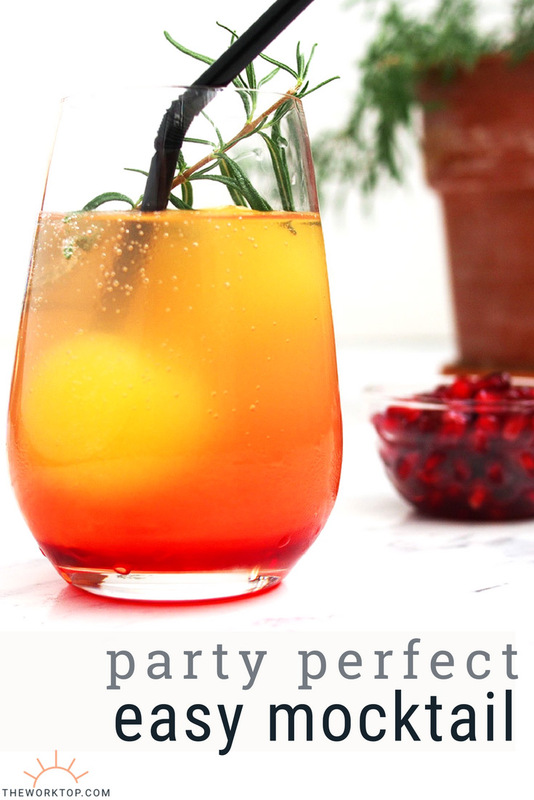 Thanks for all of these great ideas… I am so gonna have fun serving these non-alcoholic drinks for a kids party. Hi – Thanks for the question! I’ve updated it to make it more specific. You can always add more or less depending on how you prefer it. More grenadine = sweeter. Enjoy the recipe! Hi Tina…Remember me from BFC?..I love love love the drink. Finally did the round up on my blog.. Thanks so much! Can’t wait to make it :) n gorgeous pics! Do hop over and check out my lil space… thnx! Thanks, Pang! I checked out your blog and it is so much fun. You’re a rockstar even without the mocktail! Love the sprig of rosemary – nice touch. And great mocktail name!